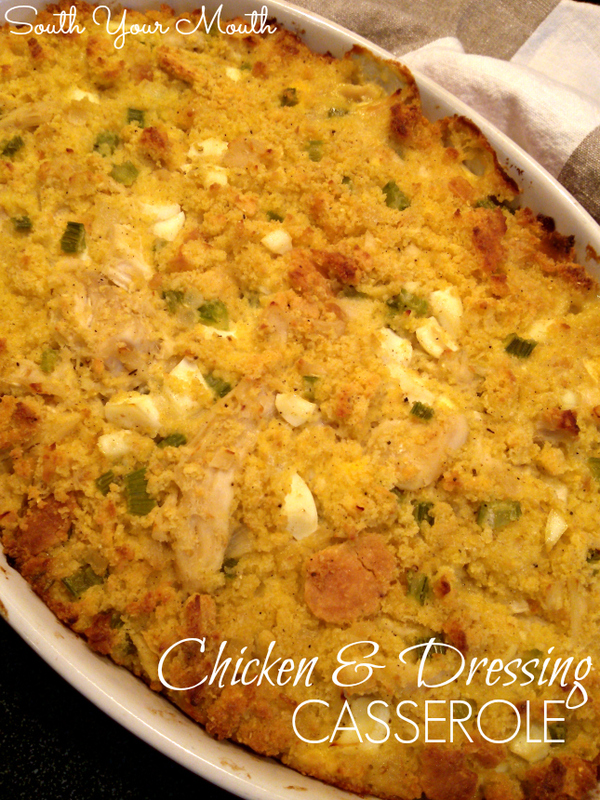 Stewed chicken and Southern cornbread dressing in a casserole. Great with leftover turkey too! I think I've lost my mojo. Or my mind. Or both. All I know is I cooked three amazingly delicious recipes for the blog this weekend and couldn't get any pictures that were worth a toot. I think it might be time to invest in a camera. And get a proper lighting setup. But, dang y’all. I don’t want to fool with all that. I’m not a professional blogger. I’m not even a fulltime blogger. I’m just like y’all. I have a fulltime job (that has nothing to do with food or recipes or blogging). I have a family. And kids. Who all play sports. Ain't nobody got time for professional photo shoots. It’s got to be easy for me. And fun! I don’t cook stuff just for the sole purpose of taking pictures and blogging about it. I cook it so we can eat it. And that means I’m taking pictures at supper time when all the good natural light is gone. If I make things too complicated, it’s not going to be fun anymore. It’s going to be a chore. And cooking and blogging is my happy time. Not my work time. I used to be perfectly happy with my perfectly mediocre photos but it’s like everyone else is seriously stepping up their game out there. Have you been on Pinterest lately? Oh well. Here’s to hoping I get my mojo back. UPDATE! I decided to play around with things this weekend and created a space by two windows to take photos to get more natural light. It was still easy and I think these turned out way better! What do you think?? Did I get my mojo back?? Anywho! Let’s talk about food! My buddy Lynn at Southern with a Twist posted this recipe many moons ago and I have wanted to make it since the first time I saw it. She did a great job with her picture. Obviously. Because I still see it in my sleep. My pictures just didn't turn out and do NOT do this recipe justice! This was delicious and would be great to bring to Thanksgiving or a potluck dinner! Slowly cook chicken breasts in broth over medium-low heat in a covered pot until cooked through. Don’t boil them to death or they’ll turn out hard and rubbery. Remove chicken and allow to cool then shred with two forks or dice into bite-sized pieces; cover and set aside. Measure out two cups of chicken stock and set aside. Meanwhile, sauté celery and onion in butter until onion is translucent. Combine reserved 2 cups chicken stock, cream of chicken soup, salt, poultry seasoning, pepper and garlic and stir well. In a large mixing bowl combine cornbread, chicken, sautéed veggies (with butter), chicken stock mixture and boiled eggs and mix well. Spoon mixture into a greased baking dish and cook, uncovered at 350 degrees for 45 minutes or until nicely browned on top. Remove from oven and let rest 15-20 minutes before serving. *You can use a box mix but I don’t recommend using a sweet cornbread for this. Marie Callender makes a great mix that’s not too sweet (I can’t find it everywhere but Dollar General usually carries it). I just used the recipe on the back of my House of Autry corn meal bag. We ate the other half with the Chili Mac the night before! Preheat oven to 425 degrees. Mix dry ingredients together. In a separate bowl, beat eggs, milk and oil together. Add to dry ingredients and mix. Pour into greased 8-inch square baking pan. Bake 20-25 minutes or until done. Makes 12 servings. Heat on medium-low heat, covered, until water begins to boil. Reduce heat to low and let chicken simmer (do not let water reach a full rolling boil) for about 10-15 minutes or until chicken is cooked through. Just when I thought I was able to hole out on cooking chicken and dressing until Thanksgiving you post this recipe!! I think its going to be Thursday's dinner.. Do you have a recipe for gibblet gravy? Go to your local butcher and get you a sack of gizzards. Liver, heart, ect.... Boil with salt, pepper and celery seed. Pull 'giblets' out and finely dice. Save broth! Chop a boiled egg. Heat broth up with a pat or 2 of butter. Make a flour slurry. For 2 cups of broth about 4 heaping tsps. of flour and 1/2 cup of the reserved broth. I like to put it in a sealed jar and shake the devil out of it! Whisk that into the broth and season with salt and pepper to taste. Let simmer slowly whisking often. Add chopped egg and gizzards after it thickens to get warm. Make and add more slurry if it doesn't get as thick as you want. This looks delicious! We like to add linguica (spicy Portuguese sausage) to the bread based dressing at Thanksgiving, I bet it would be delicious in this too. Mandy, there's another blogger I follow who has one of them pro-fessional blog sites. It's almost impossible to figure out where to click to get to the dang recipe for all them pretty, pretty pictures. You keep doin what you're doin and enjoy that supper, girl! We'll keep right on enjoying your blog! I AGREE CLINT 100%..KEEP UP THE GOOD WORK MANDY. I'm not a professional anything and it looks good to me. The recipe and the picture. I bought all the right stuff. I think one must need an eye to get these pro shots everyone is pinning. In my house we just call this dressing. We serve this at Thanksgiving & Christmas. It takes the place of "stuffing". 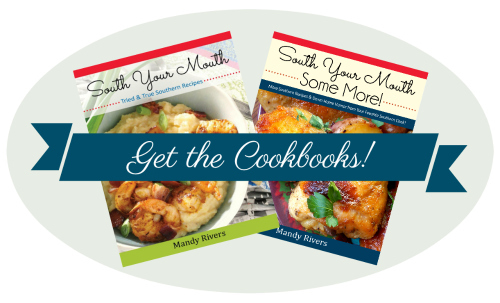 This is a very old southern dish & I think it is amazing! The eggs are a must! Although I've never used the cream of mushroom soup...I will try it next time. Hi Mandy, We are featuring this yummy recipe on Friday, can you email me the image url of the main photo? Thanks, doll! Katerina, I make dressing too but it doesn't have this much liquid or the creamed soup. Or four chicken breasts. This eats more like a casserole than what I'd call dressing. Can you use bread instead of cornbread?? Deb, I'm not sure. This seems like too much liquid for bread. But if you're after something like a savory bread pudding, I think it would work. If you try it, let us know! At Thanksgiving I use day old dried out white bread cubed small by about 1/4 amount to cornbread. I tried this recipe for the first time on Sunday and it was AWESOME! It was my first time making dressing and I've always wanted to try making it. This recipe was easy to follow and the results were great. Thanks for posting this. I will be cooking again and again! Hello!! Can't wait to try this recipe for Thanksgiving, haha probably before then! Quick question: The reserved chicken stock you mentioned... is that from the pot the chicken was simmering in? or is this an additional 2 cups of stock? Thanks!!! LOOOOOVE YOUR BLOG!!! Yes, that's the 2 cups you reserved after cooking the chicken. Good luck! I hope you enjoy! I don't sauté my Vegas I boil them and. Use chicken base half the fat I channel my yesterday when I made my chicken and dressing .it was so good! We have a version similar to this one except we add 8 raw eggs and we do not add coc soup. We use a whole hen (not chicken) -Mom says hen adds more moisture, 8 packages of cornbread (mixed) - recipe ends up with 16 eggs in it plus boiled eggs if we add them. It serves our whole extended family (30 ppl+) on special occasions. Would love to try this version as well for a simple family dinner. Oh, We add Sage! I like your recipes,have made a lot of them.Keep them coming. Thanks for the recipe, I was wondering if you can substitute stove top stuffing mix instead of the cornbread recipe ??? Cornbread tip - grease your baking pan with lard (yes! lard! ), and put the pan(s)in the oven that is preheating while you make the cornbread batter. Once the batter is ready the pan will likely be nice and hot. The lard now melted will create a buffer between the cornbread and the pan. My cornbread never sticks to the pan using this method. Pay attention while handling the batter and pan, don't forget what you are touching. Don't ask how I know, and now I own two Ove' Gloves. Hi I was just wondering is a side dish that can be eaten with this or is this a solo dish. This looks like it would freeze well . People who post recipes probably hate those of us that post comments with changes, lol. A very good dish. I did two chicken breasts, and instead of a third, I substituted organic crimini mushrooms instead. I did the veggies/mushrooms in garlic butter. I would cut back a bit on the poultry seasoning. It was also calling to me for cheese, so I put about a cup of shredded cheese into it. Not sure what the 3 chopped eggs did for the dish, but what the heck, they are good for you. Someone previously asked about how long to boil the chicken breasts for? I did mine on simmer for 2hrs. Make sure they are cooked, did not turn out rubbery. I also cooked the dish at 375 for an hour, as the dish I used(8.5 x 11? )was very full. Turned out just right. Looking forward to leftovers.